Most of us have tripped and fallen on a sidewalk at least once in our lives. It’s possible the fall was due to ice, an uneven surface, or even debris on the sidewalk. Regardless of the cause, few would argue with the premise that it’s possible to trip/slip and fall while just walking on the sidewalk. The real question is: who is responsible for these types of injuries? Who is responsible for maintaining sidewalks? You’ve likely heard the term ‘slip and fall accident’ before. Thousands of people are injured each year as a result of these types of accidents. Sometimes true accidents do happen. We trip over our own feet or slip on a liquid dropped by another pedestrian. Negligence isn’t always a part of every slip and fall, no matter how severe the injuries might be. We all have a reasonable amount of responsibility to watch there we’re walking. Those facts do not remove the obligation of property owners to ensure their properties are reasonably free of safety hazards. If it is reasonable for a property owner to be knowledgeable of a risk on his or her property, it is required that they find a way to either mitigate the hazard or protect anyone that may come into contact with that hazard. In many states, while storeowners and homeowners do not ‘own’ the sidewalk, they are responsible for the upkeep of the sidewalk. This includes snow removal and even repair costs in most cases. While it might not seem fair to be responsible for a sidewalk you didn’t install in the first place, this is the law in more jurisdictions. The most important issue to be able to prove in court is that the person responsible for the sidewalk either knew, or should have known, about the hazard and subsequently failed to remove the risk. The idea of ‘reasonableness’ is largely based on whether the owner makes a consistent effort to repair and maintain the sidewalk. The general condition of the property can also be used to show a lack of maintenance effort. If you slipped, how long had the surface been slippery? If you’re taking an evening stroll at 2:00 AM and slip from an ice storm that happened at midnight, you’re probably out of luck. However, if the ice storm occurred 3 days ago, that’s almost certainly negligence on the part of the property owner. That begs the question, “What if the government owns the building in front of sidewalk?” It depends dramatically on the local statutes. In many cases, those businesses adjacent to the government building are responsible. In other areas, the government has the sole responsibility to maintain the sidewalks. There are many issues to consider in any slip and fall case. It’s imperative a seasoned personal injury attorney review your case and provide the necessary advice and guidance needed to make a wise decision. 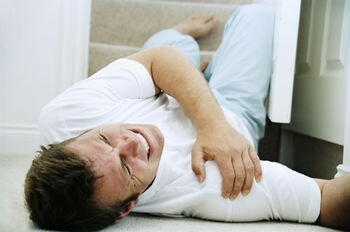 If you’ve been injured from a slip and fall accident, contact an attorney immediately.